ACCELERATE, Wentworth Innovation and Entrepreneurship Center nurtures a culture of innovation and entrepreneurial thinking among Wentworth’s students. Connects students with mentors, alumni and professionals to learn, explore, push their ideas, follow their passion, have fun, and grow. We offer programs, but also events, workshops, and fun activities for EVERYBODY. 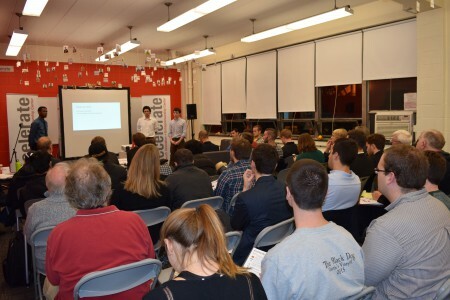 The Startup Challenge is an interdisciplinary extra-curricular program helping students develop innovative thinking skills and entrepreneurial confidence through interdisciplinary teamwork. It provides students with a platform for idea exploration, mentorship, networking opportunities and gives students permission to test an idea without fear of failure. This educational foundation serves to impact the students’ definition of success, reframe their role in a company and provide a taste of the startup culture. Inspiration happens everywhere, but particularly where you don’t expect it. We intentionally create workshops and events to encourage students to leave the beaten or predictable path of their disciplines. Alumni, professionals, faculty ambassadors, and service providers donate time to serve as mentors and functional experts to help guide student entrepreneurs and startups. Coaches aim to guide, encourage and connect student teams. 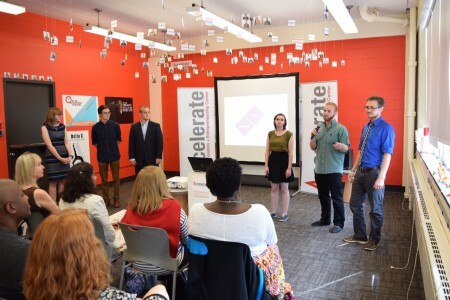 Teams can pitch for gap funding (up to $10,000) to achieve their next milestone. PitchRounds take place five times a year. Funded teams launched ACCELERATE spin offs such as Gentoo and Backroad Pedicab. ACCELERATE Alumni such as Pillar Technologies raised funding and established ventures after graduation. Product creation and social impact is a strong focus of ACCELERATE. We established a maker lab and facilitate access to the manufacturing center and other labs on campus to receive support for prototyping. Submit Your Idea to the Start-up Challenge! The Social Innovation Lab is a 12-week interdisciplinary and immersive experience encouraging coop students, the Social Innovation Fellows, to create innovations that matter, solve real world issues and work in a high-intensity environment. Students partner with an external organization, e.g. WGBH, Zoo New England, Boston Children’s Museum, State of Massachusetts and others, to address a challenge they are facing. Throughout the process the Fellows are connecting with over thirty external thought partners and organizations to harvest subject matter expertise and transfer it to the SIL challenges. Analyzing the challenge to truly uncover and analyze what the problem is and where the window of opportunity lies. Close work with various stakeholders, experts and mentors is essential. Ideation doesn’t happen alone. Each team will be on the hot seat at least once a week and utilize the insights of his/her peers as well as the innovator-in-residence to accelerate possible solutions and ideas. Wentworth students are makers turning ideas into reality. The goal is to impact lives, generating scalable solutions and impactful ideas. Early prototypes and concepts will be developed, tested, stakeholder input solicited and evolved iteratively. Each team is going to provide a scalability study to our partner to make sure that their concepts and ideas can spread and sustain within the community and/or organization. Check out updates from the SIL here! In 2018, we updated our ThinkTank format to convene both the academic community and industry leaders. 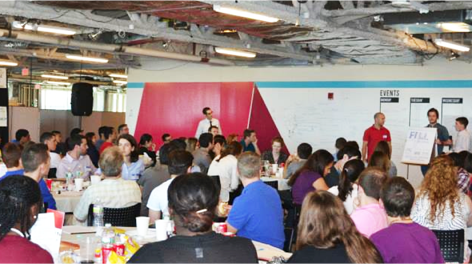 Over 50 industry thought leaders across different disciplines, students and faculty from local universities, design thinkers, community partners, and city representatives came together for one day. The intent was to challenge assumptions, explore possibilities, co-create ideas and envision the “Future of Our Cities” with a focus on “Converging Generations” – The act of bringing multiple generations together to collaborate on ideas for creating future cities that are inclusive and accessible to all residents.